A prototype bicycle built by Geoff Apps in 2006, prompted by the availability of the Shimano Nexus Inter-8 hub gear. An article about Geoff appeared in the CTC 'Cycle' magazine Aug-Sept 2010 edition. There's something strangely Valkyriesque about this image, and it's a beautiful machine. I asked on his blog if he'd mind me reproducing it here, and I'm pleased he agreed (click image to view on Flickr). The story behind all this is a familiar one: a British visionary inventor unable to achieve worldwide commercial success, the USA or Japan does it instead. Geoff's brand of bike is Cleland Cycles, a brief history of which can be read on his own website, so there's no point repeating it all here, but the comparison that has been made between his all-terrain bicycle designs and those from California that began to appear on the British market in the mid 1980s does not appear to me to be too valid. Apps-style cross country cycling is not the same as Marin County mountain biking. Geoff has a motorcycle trials background, in which the rider is almost vertical as he stands on the pedals, and this influenced the design of his bicycles, with the rider also fairly vertical but sitting on a saddle. This is the Cleland riding philosphy, which again he describes on his website. Mountain bikers you see riding around the British countryside are indeed noticeable for this upright position. But that is not how the professionals do it. This racing cyclist on a Gary Fisher MTB adopts a similar position to road riders, leaning well forward with her weight over the chainset, and she is able to reach down to adjust the fork as she rides. The bars are lower than the saddle. This was eight years ago but they are the same today. Modern mountain bikes with full suspension are ugly contraptions. The Geoff Apps prototype is certainly not, even with the height of the bars. I don't think it really matters if a bicycle like this remains a one-off, a unique creation, even if Carlton Reid wrote in the CTC mag article that "Apps missed the mountain biking wave." Geoff's 1980 Range Rider design is certainly less idiosyncratic and more like a conventional off-roader, but as I remember it, the late 80s and early 90s is when mountain bikes started to become popular in the UK, by which time American bike manufacturers with bigger markets and economies of scale were already churning them out in large numbers. Meanwhile, thirty years on, Cleland Cycles remain committed to their craft and riding philosophy. 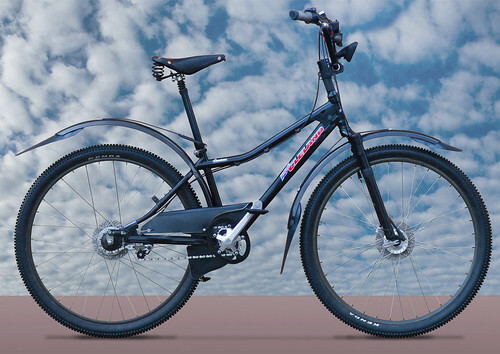 The recent AventuraTT, an all-terrain bicycle similar to the prototype shown above, has internal hub gears with roller brakes front and rear, 700c rims and 29er tyres, hub dynamo lighting at the front, the usual full-length mudguards, and of course the upright cross-country riding position. Note also an oval chainring. Posted by Patrick on August 11th, 2010. 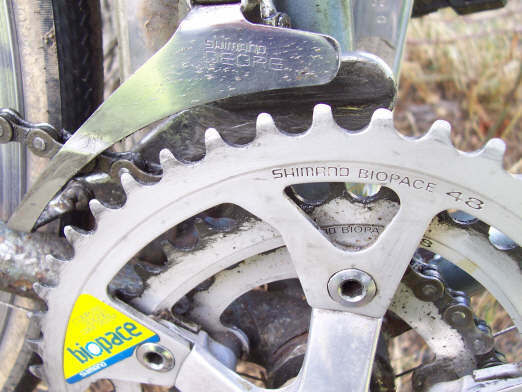 Shimano Biopace Deore chainset. Please forgive the rusty frame – it's only temporary. Highpath Engineering (direct to non-frames page) and an explanation that completely rubbishes Shimano Biopace. This seems to be yet another aspect of cycling that perfectly divides two camps; Sheldon Brown quite fancied them and gives an entirely opposing viewpoint. Good links. Mrs Taylor's Peugeot ATB still has its Biopace chainrings from the 1980s! (It also has a caliper rear brake mounted on the underneath of the chain stays.) I'm not an engineer but I assume that more than one chainring limits the degree of ovalness in order to change gear. Okay, I admit it. This issue has vexed me all night. The orientation of Highpath Engineering's oval chainring with respect to the crank is tangentially opposed to that of Shimano's Biopace. Sheldon Brown, whose authority on all matters related to cycling is of biblical stature, attributes the difference to the analysis of static geometric forces versus the dynamics of motion and momentum. Who is right? Are they both right? Do different orientations suit different riders? Are the rest of us who rely primarily on quads better off with the Highpath configuration, allowing our minor muscle groups to more effectively contribute through the dead zone of the pedal stroke? It would be fascinating to put these two configurations on a CompuTrainer and compare the applied torque. In the absence of metrics, is there anecdotal evidence out there to substantiate or refute either point of view? Most importantly, should I or should I not consider getting an oval chainring? I was not aware of them until now – they are a revalation. Do they work? Or, when I'm pondering this in the middle of the night, should I just roll over and go back to sleep? Neither is right. It's smoke and mirrors. My ATB used to have Biopace. I haven't used a Highpath Engineering oval type chainring. I can't see how either offers an advantage over circular. Neither Alberto Contador nor Andy Schleck use them. If they were faster or more efficient, they would. Sheldon's Brown's suggestion that the momentum of your feet carries the pedals through the "dead spot" when the cranks are near vertical seems far fetched. That would imply that the pedal is pulling your foot. Doesn't make sense. A rider has only a certain amount of energy that he/she can deliver, irrespective of muscle group, and an oval ring does nothing to change that over the course of a ride. And surely, the dead zone is simply the other leg's power zone. It's like the 'other debate' about pulling up one pedal while pushing down on the other. There could be odd situations – riding a fixie up a sharp curved incline or something like that – where special devices might make a short term difference but overall I see pedalling as a simple intuitive action with a consistent relationship between effort and speed, i.e. keep everything round. There's some research here (1.05 mb PDF) which concludes "the Hull Oval may be considered as being the best performing non-circular chainring but will probably be problematic for practical use" and "Biopace is a totally wrong concept." When I started cycletouring again last year it was on my Biopace-equipped bike. The pain in my left knee returned. I'm still not sure if that was because of the oval chainrings or just because I hadn't been on a serious bike ride for so long. I haven't ridden the Biopace bike this year (problems with the rear derailleur) and I have no knee pain on my new bike. (Although interestingly, I have the same pain in my right knee when I walk down steep hills and I've had that pain, again in my right knee, both times I've gone running this year.) Hmm. When I've done my C2C I may ride the Biopace bike again to see what happens. Thanks for the comments. By the way, the pictured Aventura was built, or completed, late 2009, and is dubbed the 'AventuraTT' ~ TT standing for Twenty Ten. When your legs are in the power stroke and at their strongest (9 & 3 o'clock) you have a higher gear, and when they are in the dead patch and at their weakest (12 & 6 o'clock) you have a lower gear. That's really all there is to it, no magic, smoke or mirrors. Thanks for the correction on the Aventura bike. There seems to be agreement on the mechanical principle of oval chainrings (of either type). I think the question is whether a rider cycles more efficiently with one under normal cycling conditions. I've heard opinions and arguments both ways but no-one has provided proof of what they are saying. That's what I mean by smoke and mirrors. Maybe you can train yourself to be more efficient or go faster with an EggRing. I haven't tried so can't say for sure, but I would be surprised if one can. I doubt if you can go faster with EggRings (forget Biopace here), but you can ride more efficiently. B) Steep hill-climbing is when you're most likely to run out of legs, and that usually occurs with the legs in, or just coming out of, the weaker phase of the power cycle. Because an EggRing offers a progressive lowering of the gear ratio, you are more able to push through and complete the rotation. A further benefit is if you are climbing that hill on a low-traction surface; with a conventional circular chainring, your output is strong-weak-strong-weak-strong with the resultant wheelspin over the strongest portion of the power cycle, and the commensurate slowing down while the legs transition the low power phase. An Eggring, of course, evens out the variation in power output, and thus reduces the inclination for our tyre to lose traction (same reason I use roller-brakes, incidentally). A further phenomenon is that EggRings provide such an increase in efficiency that your brain is fooled into thinking you can push a higher gear, and you change up a gear in response. Then, of course, the transmission feels sluggish, and your legs tire quickly. After using EggRings for over twenty years, I am still fooled by this. This is unfortunate in that a lot of people trying out EggRings for the first time, don't realise that this is going on and, quite rightly, say they find that Ovals make the bike slow down. Yes. It's an interesting subject. Pedalling is fundamental to cycling. As I see it (and I'm not an engineer, nor have I used an EggRing), on a flattish course where the bike is moving along nicely at a constant speed you want the chainring turning at a constant rpm and not have the effect of a gear change twice each revolution. I've thought about this in recent days when I've been out cycling, and pedalling is something you do intuitively. You're not thinking about particular parts of the pedals' rotation. You just push with one leg then push with the other, and so on. If I concentrate my mind on parts of the revolution when actually cycling, I can feel the power bit is approximately from 1 o'clock to 4 o'clock (for the right side crank), or perhaps 2 o'clock to 5 o'clock. It doesn't really matter which. For about one quarter of the turn you are able to push. Then up comes the other leg and you push again. And you are pushing at the part of the cycle when the crank is in the region of horizontal, when you can apply your weight. Over the duration of a ride, you have only a certain amount of energy available. If you are able to extend the part of the pedal revolution during which you can apply power, you are simply using up that energy faster, so either you slow down or you can't ride as far because you are worn out sooner. I do accept that when climbing steep hills or going over rough ground there might be a way to learn how to use an oval ring to deliver more power for a short time, but the benefit will be short-lived and you will need to recover, either on a downhill or by slowing down. This is similar to the argument that being able to pull up by being clipped in gives you an advantage. My feeling on this is that the discussion remains at a theoretical level. In practical terms, round chainrings will always work as well, if not better than oval ones. Hmmm, I'd hoped I'd sorted that one; The EggRing idea is NOT meant to add power on, but to relieve the dead zone of the power cycle. You're quite right, there is a tendancy for the brain to want to push forward, but when using EggRings, you must resist this temptation, relax and stay in the lower gear, the gear you'd probably be in with a circular chainring, and enjoy the fact that your dead zone is not quite as taxing as it would be with a circular chainring. I might try an EggRing one day, if I get the chance. Then I'll know a bit more about what I'm talking about! I've read somewhere – and also at Takano's link – about rotating the Biopace chainrings through one increment on a 5-bolt system. Perhaps something to think about? On balance I'd say an oval chainring is worth considering. Geoff, by the way, that's one good looking bike! I purchased a Cleland from Geoff Apps in the early 80's and moved on to a Highpath in 1986. I still use that same Highpath today but of course it has now has egg rings even though it did not when first featured on the cover of New Cyclist Magazine. I have posted the front cover on my website for reference. Grahame, the Highpath bicycle link on your website went to your Legal Information page. Perhaps you could repost to show the front cover of New Cyclist Magazine? Like Grahame White, (Hi Grahame, good to hear from you after all these years), I bought a Cleland and a Highpath in the 1980's. I still use both and have developed a modern full suspension version that uses EggRings. The research document published above by Patrick is very interesting and is concerned with the crank power for given biomechanical joint moments when pedaling at a cadence of 90 crank revolutions per minute. It concludes... "the Hull Oval may be considered as being the best performing non-circular chainring... ...with a 3.3% increase in power output compared with an equivalent round ring". However my experience is that it will be difficult, if not impossible, to spin such an extremely non-round ring at such a high cadence. This is because, unlike a round ring, the feet need to accelerate and decelerate twice per revolution. My interest in using non-round rings is how they perform at low cadences and where there are high pedaling resistances due to steep hills, headwinds etc. In these situations they can improve efficiency by reducing the amount of deceleration that takes place in between the pedal strokes. I understand that this is also the reason why Geoff Apps is using EggRings. It is not an issue of going faster, but of saving energy and so being able to cycle to the top of the hill without having to stop from exhaustion. With very elliptical EggRings we are not talking about increasing speed, but reducing the amount of energy needed in certain, low cadence, circumstances. However, the research document is talking about improving speed. I would be fascinated to know if their predictions for the Hull Oval could be reproduced when tested for real. Hello Grahame! A name from the past. Are you going to come on a Birthday ride? I presume you've looked at the Cleland website? How do I access your website? Chris: yes, you can rotate a BioPace to improve efficiency, but it will only ever be a compromise; you will not get the full benefits of EggRings. Graham Wallace hits the nail on the head: it's not about pandering to the obsessive preoccupation with speed, it's much more to do with efficiency at slow speeds. However, when out riding with 'faster' mountain bikes, my lumbering Cleland seems to go at about the same speed, and I can give them twenty or thirty years! Has anyone noticed the pedals? I noticed them: one-sided flat pedals, suspended from the end of the crank. Do they work well? They're nothing new, but my design is relatively simple. Let's get one thing out of the way before discussions begin: THEY DO NOT MAKE YOU GO FASTER!!!!!! The main advantage is that your foot is 'cradled'; if you push your foot forward, the leading edge rises and minimises the possibility of your foot sliding right off. The same applies backwards. Another useful thing is that they effectively lower the bottom bracket height, quite good for very tall people who feel they're cycling in the stratosphere, or for smaller people who lack a little confidence; they can set their saddle closer to the ground. In my case I can have oodles of ground clearance under the BB. The bearings, by comparison with mainstream pedals, are very large and strong. They can be renewed in a matter of minutes (if you're in a hurry). They fit standard cranks. There's a larger picture on Flickr: go to the Cleland website, click on 'More Photos' at the bottom of the Flickr panel (to the right) and range through the pictures until you come to it ~ I think it's on the second page. Your comments there are very welcome! If anyone's interested, I created a new image of the AventuraTT for the home page of my website. It includes some recent modifications to the prototype, and some more cunning photoshop techniques! New Cyclist mag is now available to partial read at OWLarchitecture.com where I have put my Highpath up for sale.